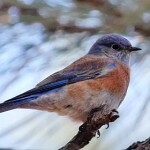 Description: Male’s upperparts and throat deep purple-blue; orange-red breast, sides, and flanks; grayish belly and undertail coverts. May show some orange-red on shoulders and upper back. 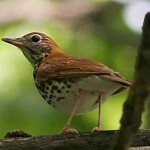 Female is duller overall, with brownish-gray head, throat, and back . Juveniles like female, but grayer and with speckled underparts. 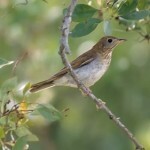 Habitat: Migrants can be found in open plains and foothills, open woodlands, farmlands, and orchards. Where in Nebraska: Rare vagrant. Individuals seen during both spring and fall in Dawes, Scotts Bluff, Webster, and Knox Counties at least on five occasions. No breeding records for Nebraska. 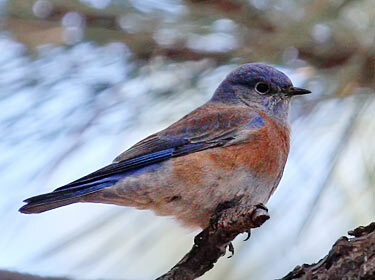 Fun Facts: Adult Western Bluebirds often beat larger prey items against a hard surface before feeding it to young.